Ms. Beach has taught 7th and 8th grade literature and has been Calvary’s Library Media Specialist since 2013. She has 16 years of teaching experience in the middle school setting. 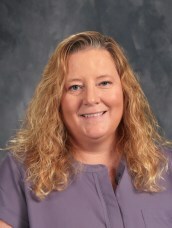 Ms. Beach has a BS degree from Indiana State University in Mathematics and Education and a Masters Degree in Library Science from Indiana University. Ms. Beach enjoys spending time boating, camping, hiking as well as watching her teenage children, Joslyn and Zander, perform on the Center Grove drumline.